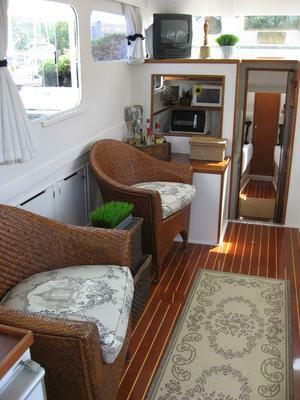 “The vessel as a whole was constructed using the finest quality workmanship and marine grade materials throughout. The vessel has undergone constant upgrades over the years and expertly maintained as a classic yacht. The main construction material in her hull is cold molded mahogany with a fiberglass overlay on the exterior and interior of the hull. 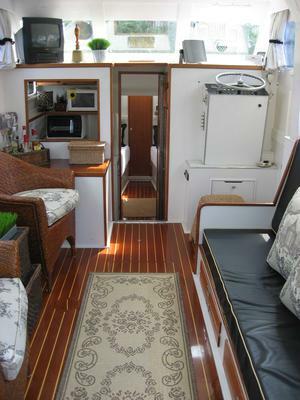 The deck is constructed of marine grade plywood also covered with a fiberglass laminate. The vessel is powered by twin 350 H.P. Crusader gasoline engines. Upon completion of the survey, the vessel “Beighleywick” appears in sound structural condition, needing only routine maintenance work, as is usually the case with a used vessel at the time of spring commissioning. She has been used as a pleasure cruiser and has been maintained in above average condition, having been kept in near bristol condition. 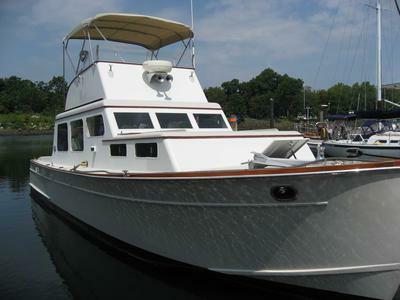 The vessel has been maintained to very high standards and is aggressively priced at $108,000. The April 2010 survey is available to serious inquiries only. The Ortega hull is a planing hull ("Quadraconic") developed by Huckins for WW II PT Boats - it was so successful it was licensed to two other companies building PT Boats. The hull design was noted for its lack of pounding at speed. In addition this hull is considered quieter underway due to its composite construction. which is on the same level. heater. An icemaker is located in the salon. Danforth and Yachtsman anchors secured on fore deck. 2 ½ inches of extra head room in the salon. One of only 4 Ortegas built with extra head room. Complete re-build of flybridge. (Work completed by Huckins). Flybridge seats 4 comfortably + Captains’ chair. Stidd Captain’s chair on flybridge. Cockpit bench specially made by Huckins. 29” deep x 7 ½’ length. Perfect or napping. 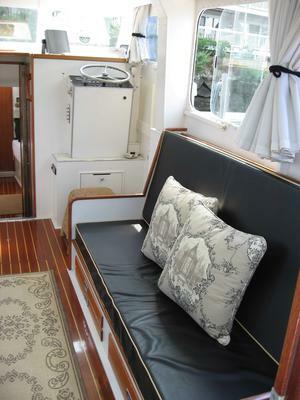 Custom beige and white striped cushions made for cockpit and flybridge. Cockpit cuhions include cushions for motor mounts. 5” custom-made mattresses for v-berth. Extra custom shelf in galley for additional storage. Custom davits for dinghy transport. If this boat is still available, please call or email me.